Get ready for Santa and bring holiday merriment to your tech gadgets with these free Christmas phone wallpaper designs. I created these free wallpapers to celebrate the launch of my brand new graphics map kit called Santa’s North Christmas Village. The new graphics set will be available on Friday, November 23rd, 2018 (Black Friday), but you can download these right now to start enjoying the adorable graphics on your screens! I am doing things differently with this product launch and typically the wallpapers become available closer to the product launch date, or after the product is available for purchase. But, I wanted you to enjoy them now! I also created several different designs, including desktop versions (you can find those here). 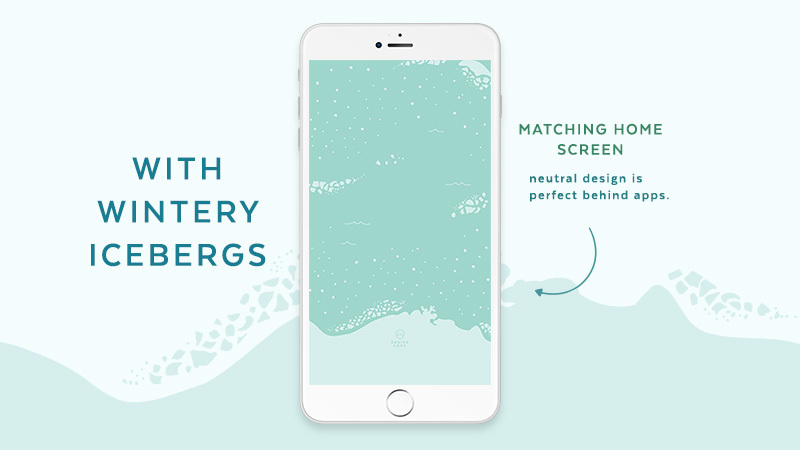 Download one of three designs for your lock screen and a neutral iceberg design for your home screen. HOME SCREEN WALLPAPER BACKGROUND TOO! The graphics used in these wallpapers are from the new north pole map design kit Santa’s North Christmas Village Map Design Set, which will become available on Black Friday, November 23rd, 2018 on this website at an incredible price only available to newsletter subscribers. Sign up here to be on the list when it releases!